People who have followed my blog know my story. I'm a single, never-married white woman. My sons are African American. They were students at my school and I adopted them when they were seven and nine. Our journey has been long and bumpy. Many, many people including a former boss, teachers, and football and basketball coaches, have been the village that have surrounded and raised my boys. A single white mom, with two black boys, is probably not ideal. I know I did a lot of things wrong. But one thing I did right is to fill my sons' lives with books. And I made sure that we had books with people that celebrated my boys. 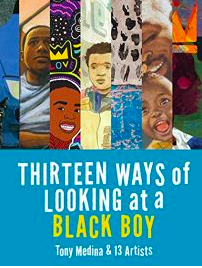 THIRTEEN WAYS OF LOOKING AT A BLACK BOY, by Tony Medina and 13 Artists, is a book that I wish I had been able to give my boys when they were growing up. The title, as those who are more literary will probably recognize, is a play on Wallace Stevens' 1954 poem, "Thirteen Ways of Looking at a Blackbird." The thirteen poems, all in the tanka form, are a celebration of black malehood, arranged chronologically. The first poem, "Anacostia Angel," captures a black baby with a fly bow tie and koolaid smile. In the last poem, "Giving Back to the Community," a black man returns to teach in his community. In between those two are poems that celebrate church, thie middle school/high school flirt, a teenage athlete chasing his bus, and several others. Many of the poems are set in Anacostia, "a historically black neighborhood in Washington, D.C., which is quickly becoming more gentrified." Anacostia was also the home of Frederick Douglas. The art in this book is absolutely spectacular. Thirteen different artists, including well-known picture book artists Floyd Cooper, Javaka Steptoe, and R. Gregory Christie each contributed one illustration, everything from watercolor, to pencil-like sketch to watercolor, to mixed media. Wow! I think this book would be a terrific addition to an art class- kids could pick one object and explore it in through several different mediums. Extensive back matter gives information about each artist, about tanka, and about the Anacostia area. "Brothers Gonna Work It Out"
Brenda, at Friendly Fairy Tales, is hosting Poetry Friday today. 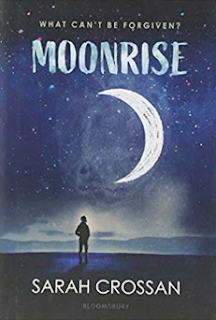 Joe Moon is seventeen years old. and hotfooted it to Texas. taking a phone call from Ed. ended up on death row. and possibly to say goodbye. Can't believe it's been a month since I have blogged! I have had rough spells, but I am pretty sure this is a record for me. Can I blame the beginning of the school year and 67 sixth graders??? Anyway, I'm back at it now. I'm a CYBILS poetry judge, so from now until the end of December, you can expect a whole lot of poetry books and novels in verse. 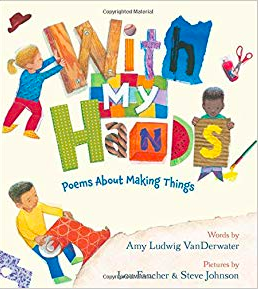 Amy Ludwig VanDerwater's WITH MY HANDS: POEMS ABOUT MAKING THINGS is up first. The book, which debuted in March, begins with the poem, "Maker." A maker is a tinkerer. WITH MY HANDS goes on to celebrate the joy of creating. There are poems for artists, for builders, for bakers, for sewers, actually twenty different poems about things to do or make - painting, clay, birdhouses, snowflakes, piñatas, parachutes, boats, cards, knot, soap carving, tie-dye, collage, spaceship, sock puppet, cookies, leaf pictures, a fort, origami, knitting, a shadow show. I made a tie dye. watched him drift to earth-- fantastic! Should I admit this book made me a little nostalgic? When I was a little girl, I was constantly making something-- water color paintings, bean pictures, clothes for my dolls, a carnival. My boys were always digging, building, cutting, drawing, baking. I don't see kids doing as much of that anymore and it makes me sad. I envision this book opening up whole new worlds-- I hope it would cause kids to say, "Could I really make/do that?" I envision myself putting this book at a center in an elementary grade classroom, along with all kinds of "making" materials. I also think it would be a terrific Christmas gift- along with a box of things to use for making- yarn, googly eyes, markers, construction paper, beads, etc. 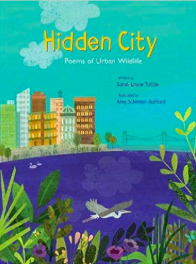 Thanks, Amy, for another terrific offering to the world of children's poetry!